Available in either black and chrome, or orange and chrome, the Pro Series Juicer is as easy to clean up as it is to use! The three corrosion-proof juicing components, including the polycarbonate dome and spout, lift off into dishwasher-safe parts. Weighing only 12 pounds, The Pro Series Juicer is 110v or 120v compatible, and has a patented processing system that systematically separates the juice from the pulp. 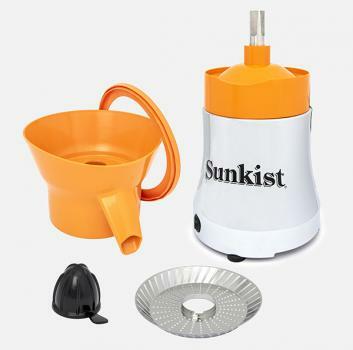 It is a perfect example of the Sunkist quality that you’ve come to know and trust. We have also included a two-year warranty with your purchase, to protect against any unlikely breakdowns. The Pro Series Juicer is modeled after the Commercial Series Juicer, and utilizes the same high-torque, metal, oscillating strainer that you’ve come to know and love. It’s activated by the juicer’s micro sensor switch. 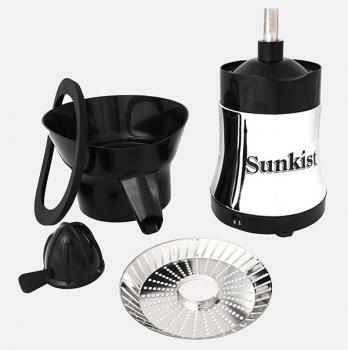 The quiet, heavy-duty strainer operates quickly and easily, giving you the most juice out of each piece of citrus fruit.